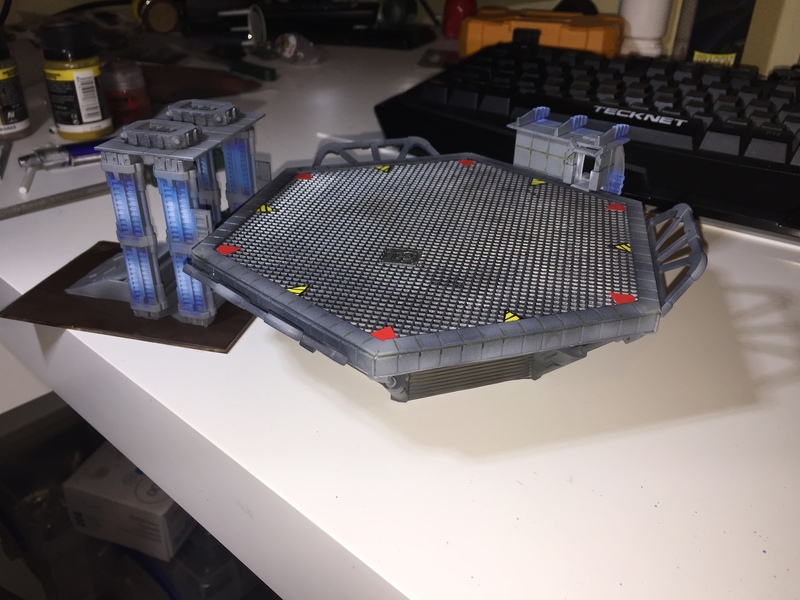 This is a project to build a Dropzone Commander table that doesn’t involve a cityscape. 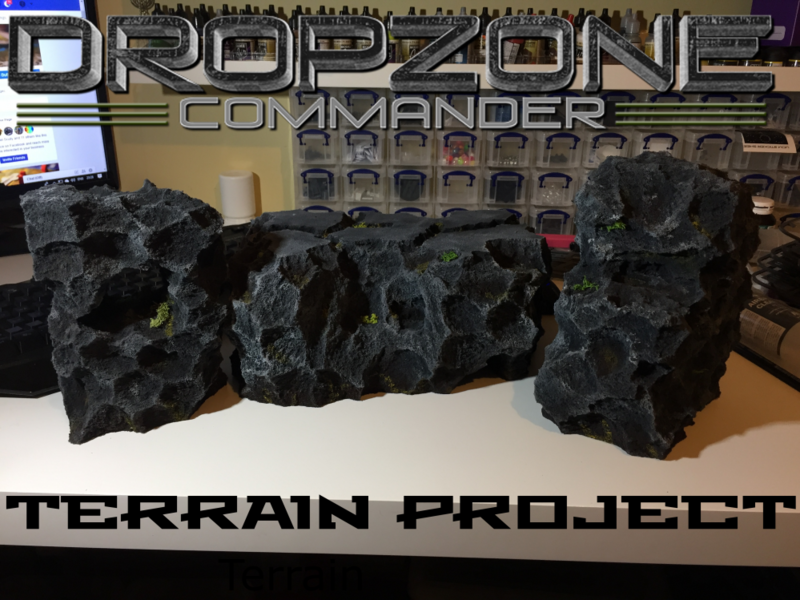 Mountain stacks and valleys will be the terrain set along with some structures that fit a "not a city" table but still allow for some interaction so that it still has all the elements necessary for a good game of Dropzone Commander! 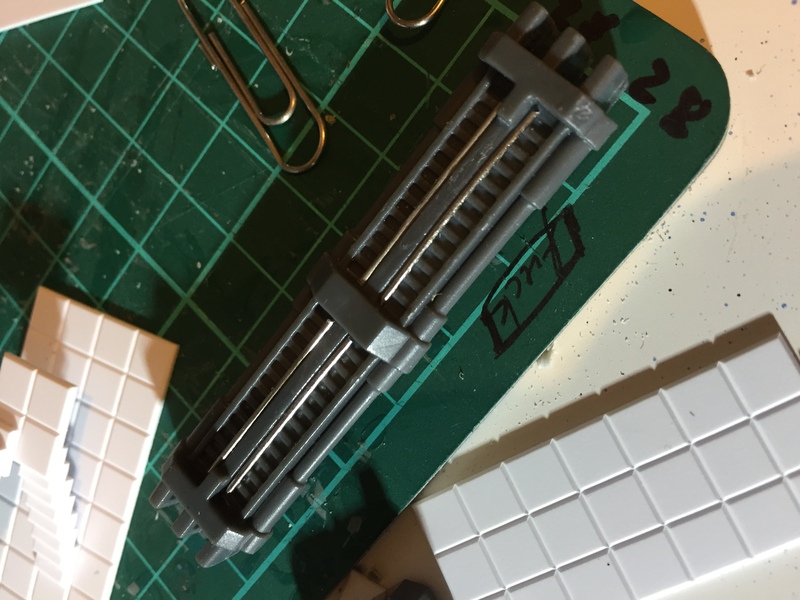 It’s been a hectic few weeks so I haven’t gotten much done lately. 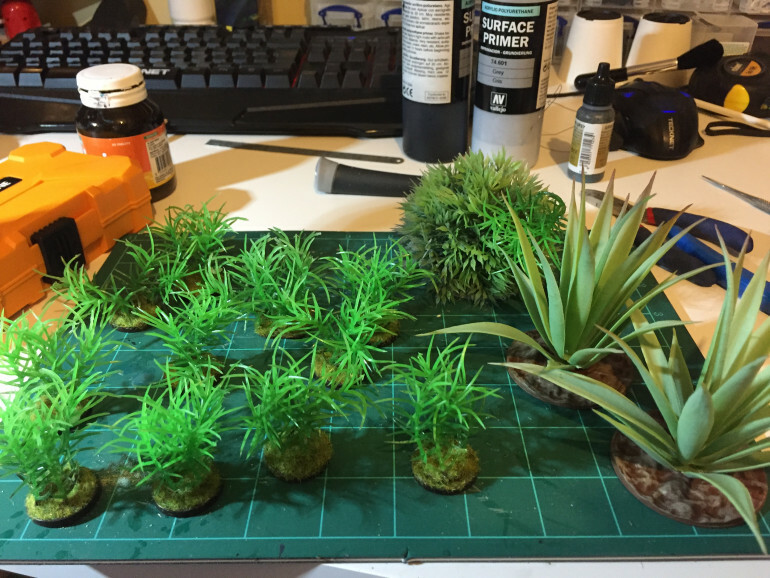 I’ve put together some aquarium forrestry, which I plan to hit with some airbrush colouring and a matt varnish to take the shine off. 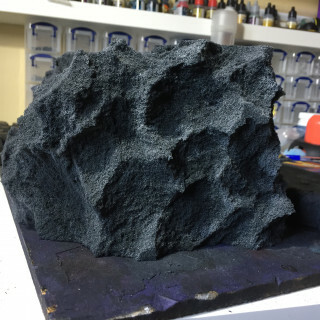 I have a good bit more of this and I’m debating whether I like the bases or not. Leaning towards not… too grassy. 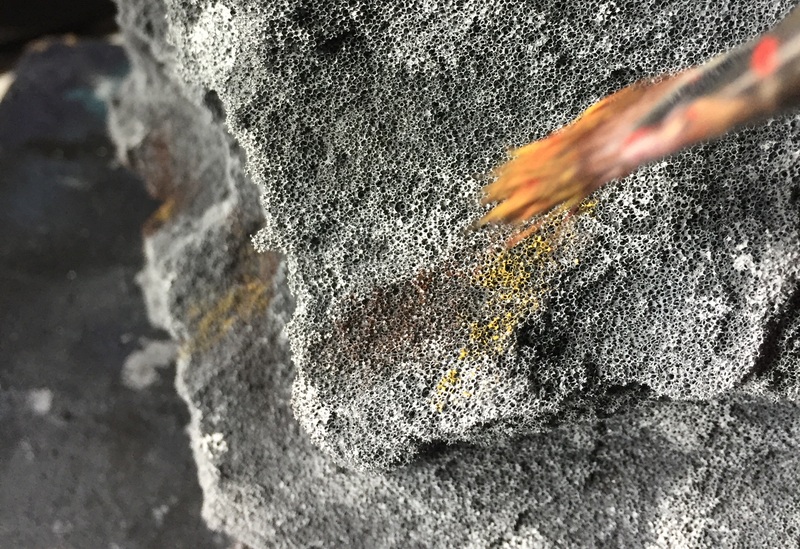 I’ve also managed to get bits sprayed which will be forming parts of structures exposed from the rockfaces. 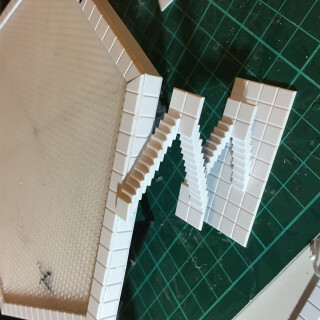 The plan is that these pieces are all slotted into cuts in the foam so they are held in place by the foam itself and this will allow me to remove them if I just want to use plain mountains. 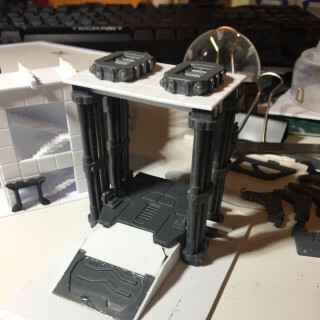 I’m waiting for a few bits to arrive to finish off the landing platform and I need primer to get started on the bits and pieces to slot into the foam so in the meantime I had a bit of inspiration for a few smaller buildings. 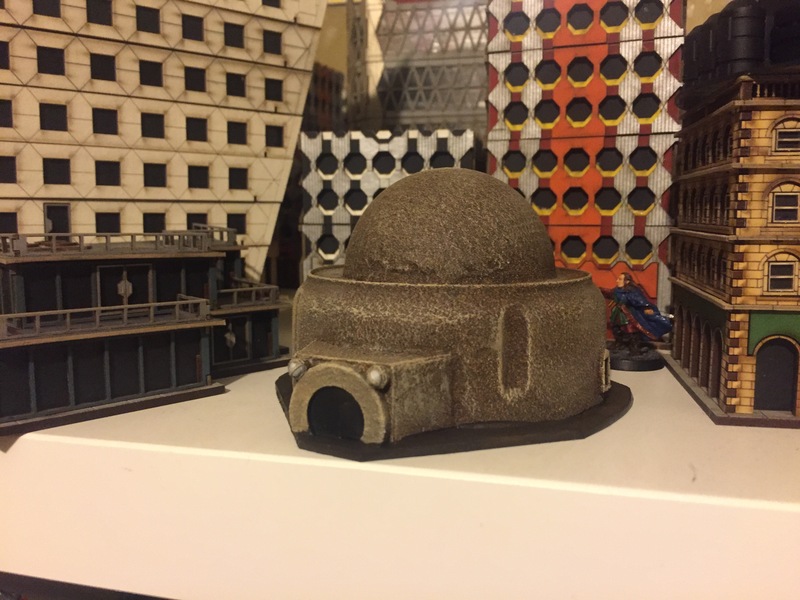 This one is a test and I was sort of going for the look of Star Wars tatooine buildings. 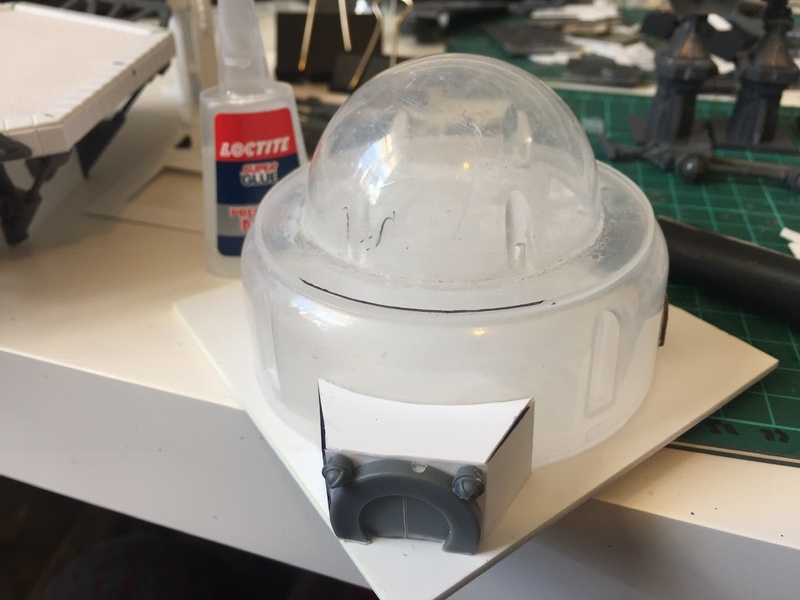 It is made from a Johnson’s cotton bud container lid, a random plastic dome, a few bits of plasticard and a couple of leftover windows from 4Ground kits. 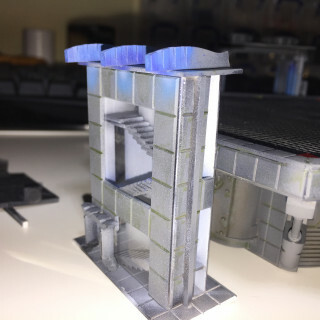 The door is made from a mantic games 25mm infantry base and I grabbed a couple of lights from my 40k city’s of death stuff for over the door. 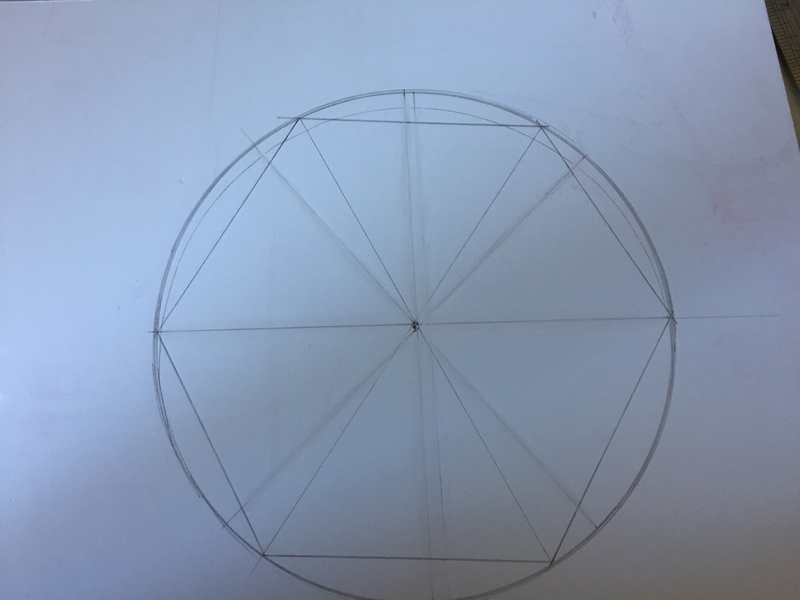 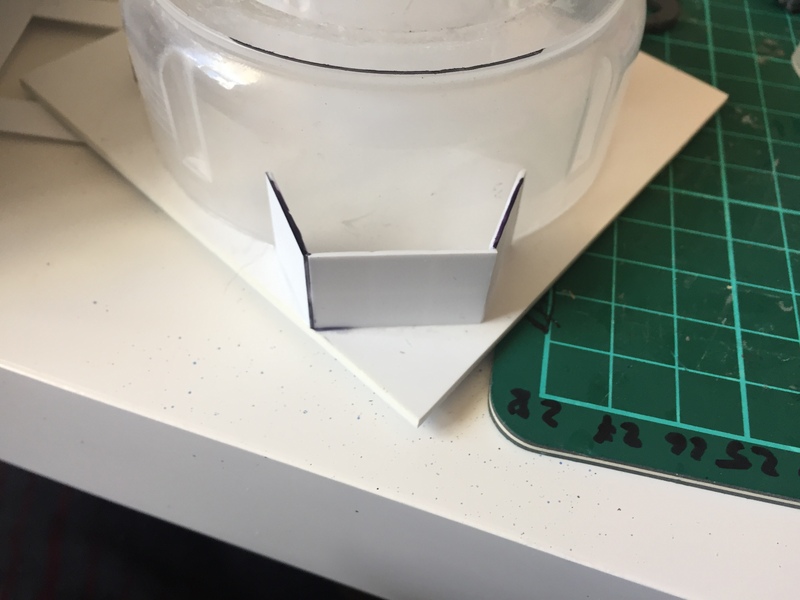 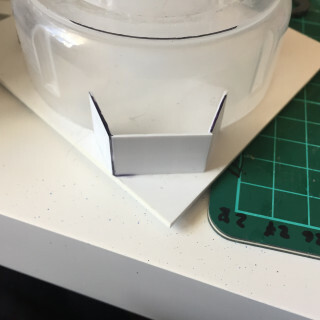 One tip for cutting the curve into the plasticard to go flush to the building is to use a sharpie on the rim on the lid and press the plasticard to it while it’s wet. 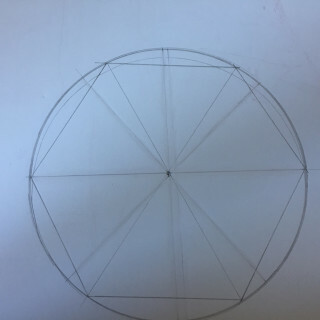 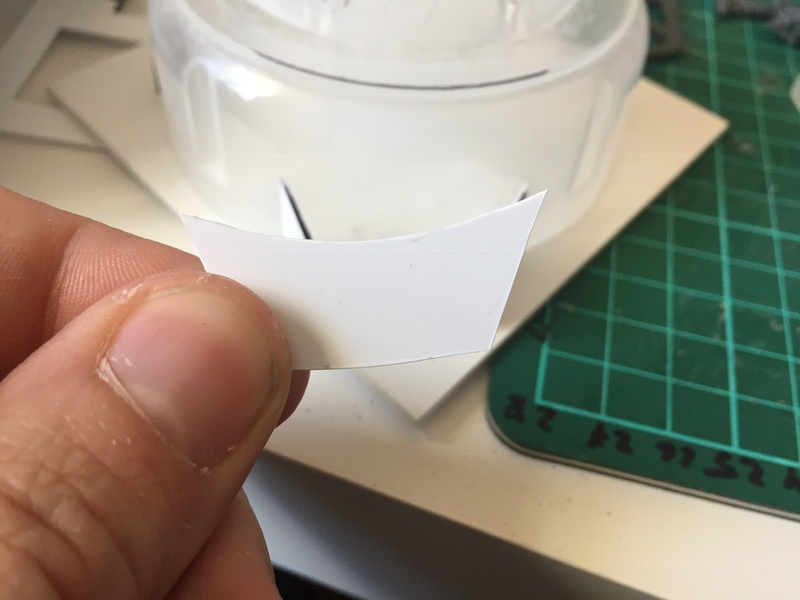 Then simply cut along the line. 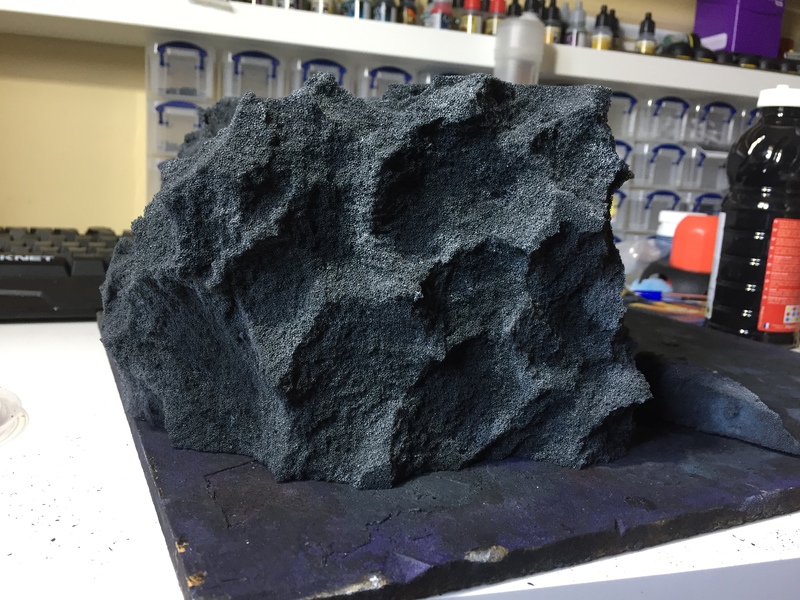 once the texture set I dry brushed it a few times with different shades of brown and desert yellow and ivory sand. 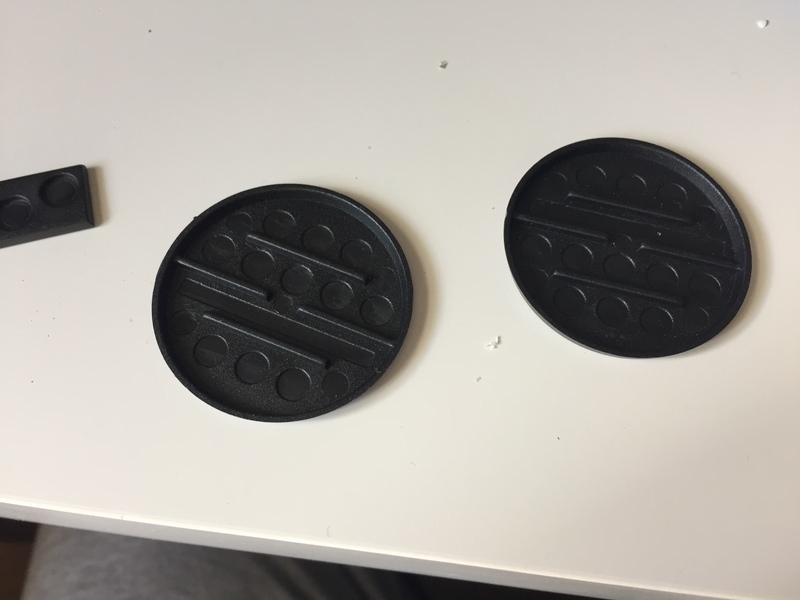 I’m pretty happy with the result and they are quick to produce. 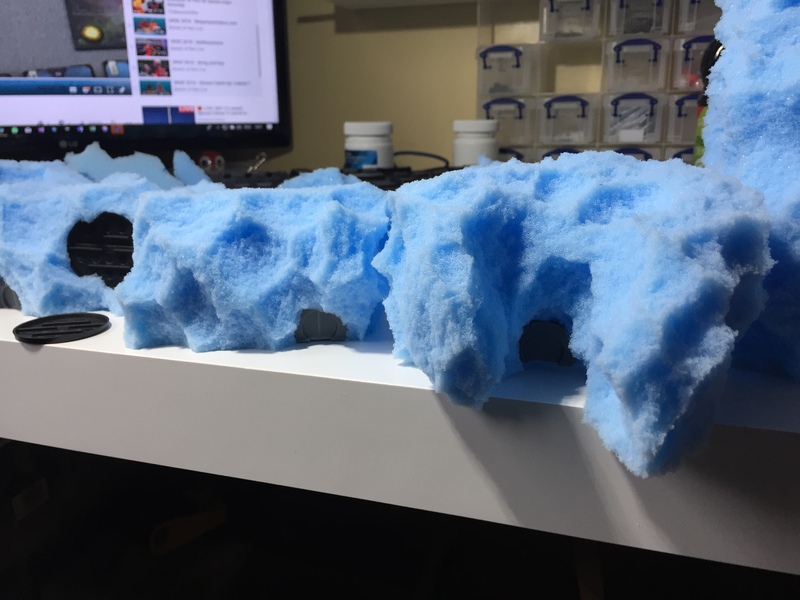 I might paint them differently to better tie them into the colour of the foam mountains, Schmaybe… I haven’t decided. 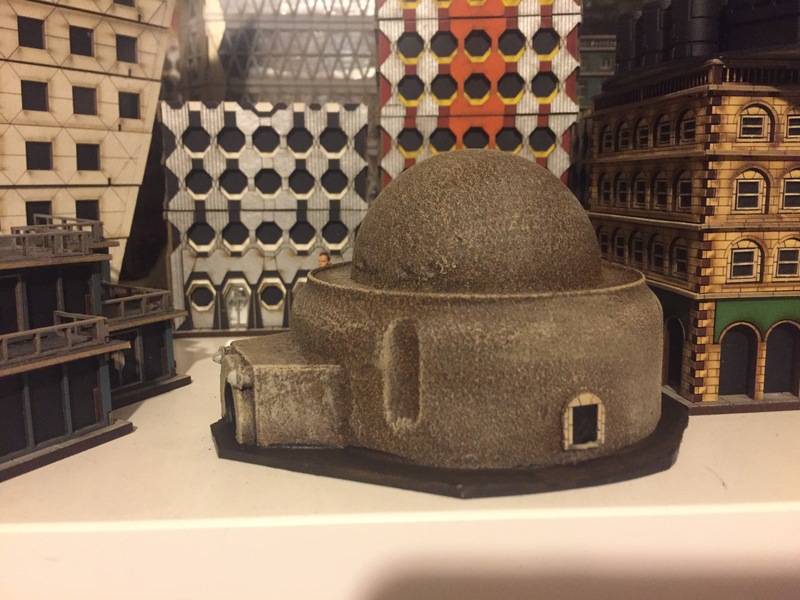 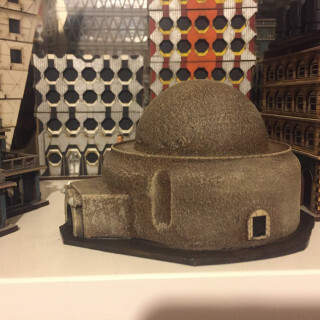 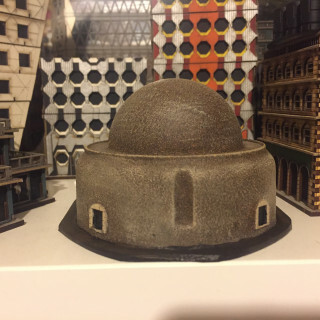 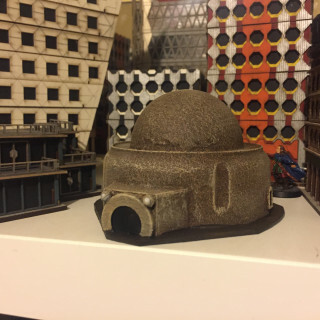 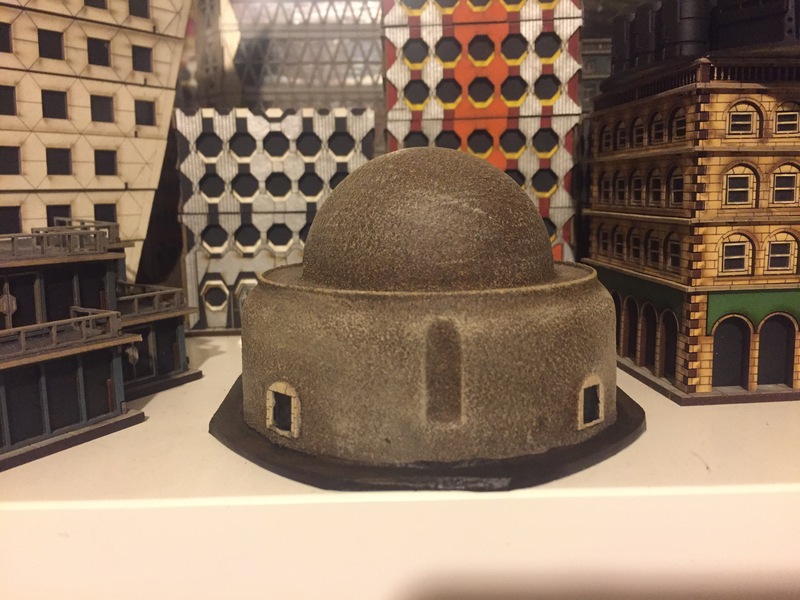 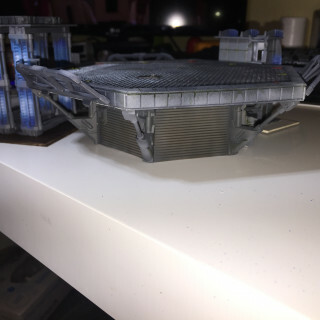 I can build about 8 of these with the plastic domes, so I might experiment with different sized buildings. 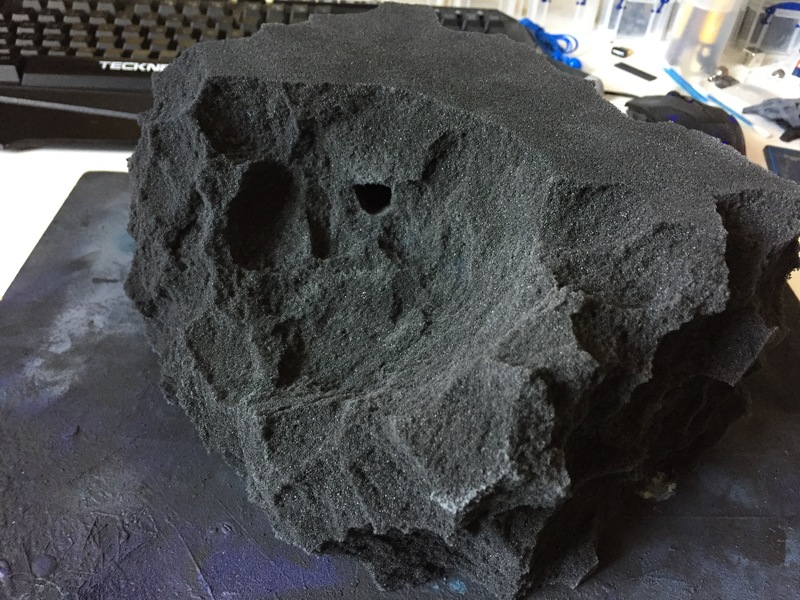 So the airbrush made pretty short work of the painting process. 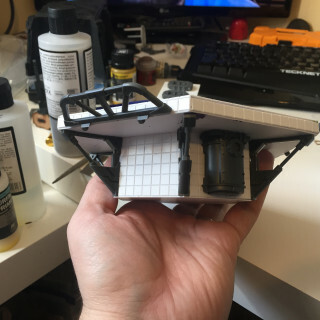 Not finished yet, but I made a ton of progress. 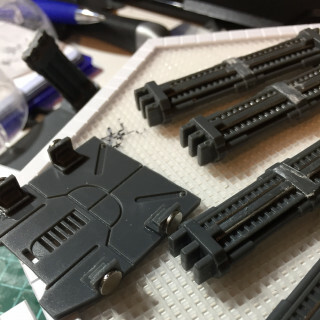 I still need to do a bit of detail work and I want to add a bit of weathering. 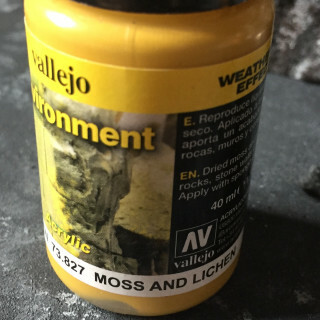 At the moment I’ve used the Streaking Grime & Rainmarks from Vallejo on some areas but I’m being pretty cautious as I’m a weathering noob to be perfectly honest! 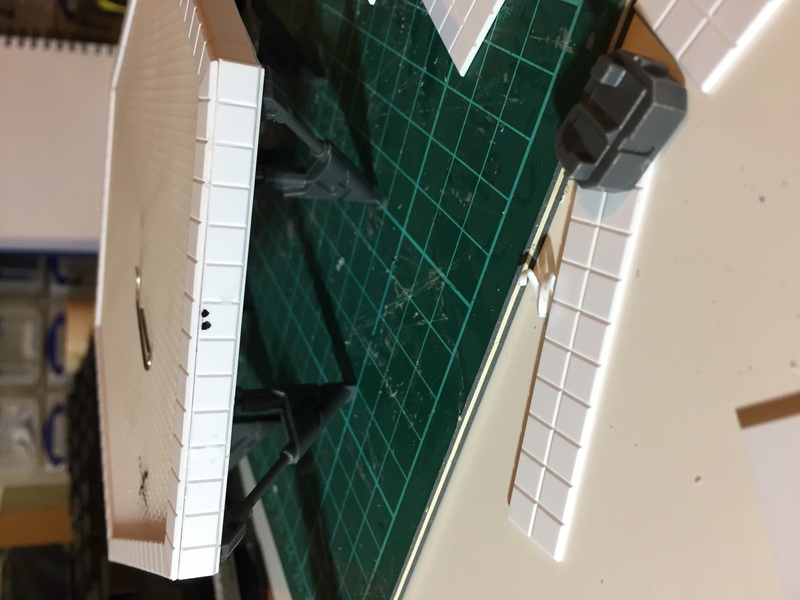 I think the main platform needs something – it’s too plain at the moment. 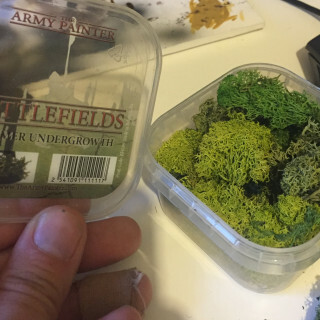 I had hoped the painting process would have made that less obvious but sadly not. 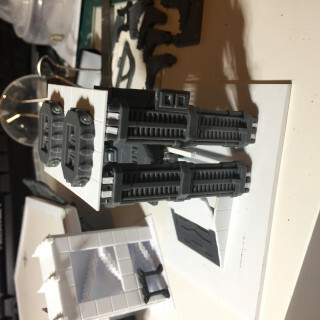 This project is a good opportunity to build some different buildings. 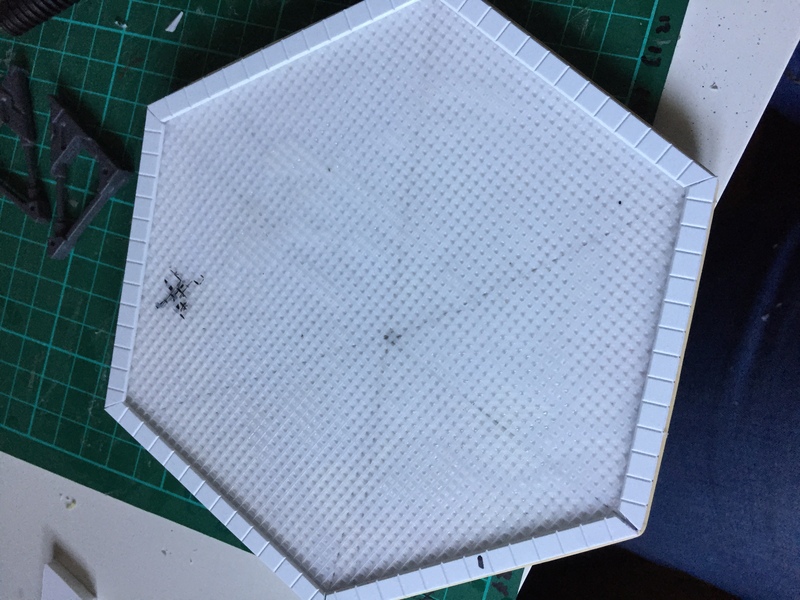 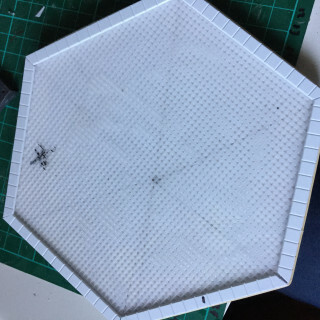 I got inspired to take a break from foam and build a vertipad. 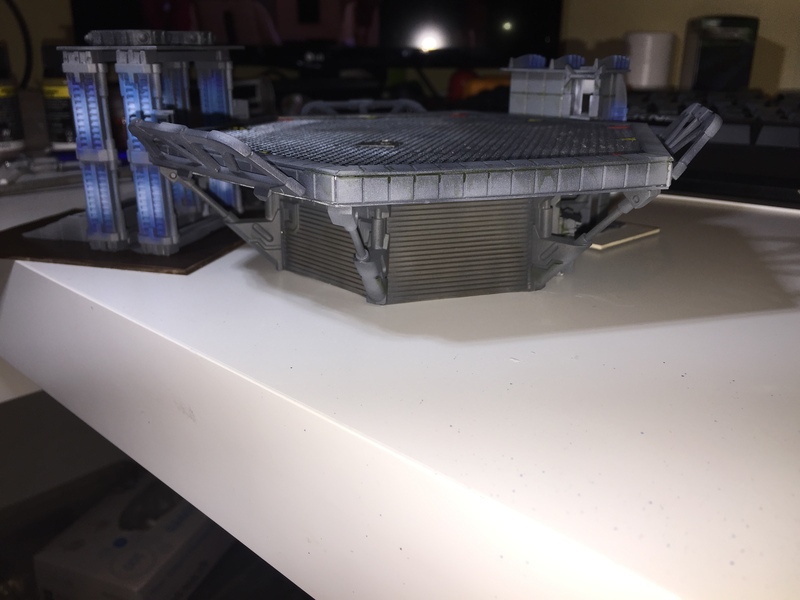 The aim is to build something which has the functional look of a landing platform and is a structure in its own right. 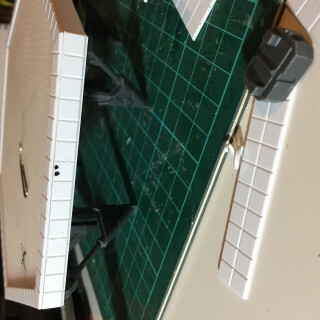 I cut the main platform from foamcore and panelled it with plasticard tile. 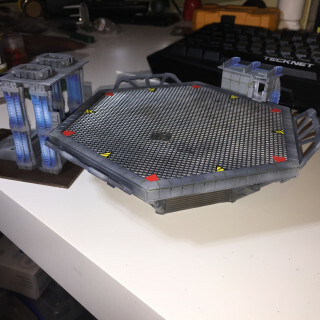 I added height using support struts from the Mantic Battlezones range and gave the top a metal mesh look using crochet mesh, pva’d into place. 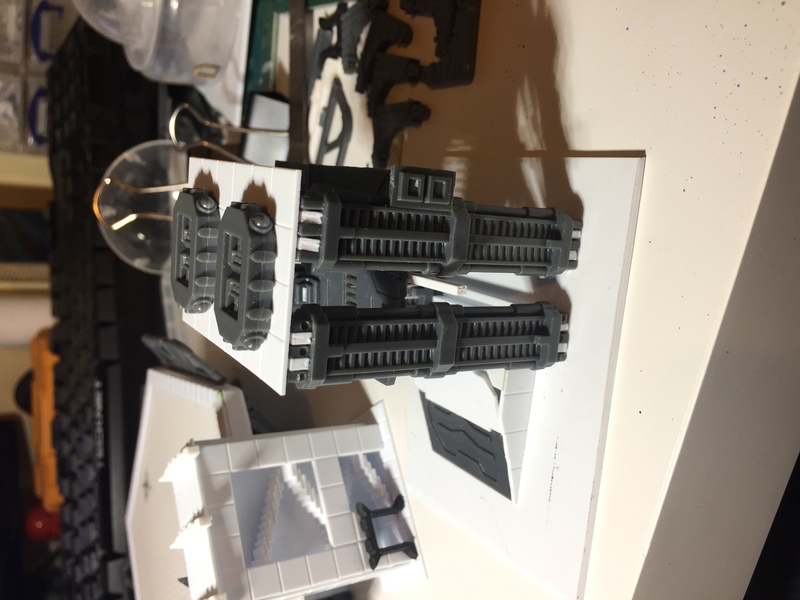 I then added walls between the struts to create the structure. 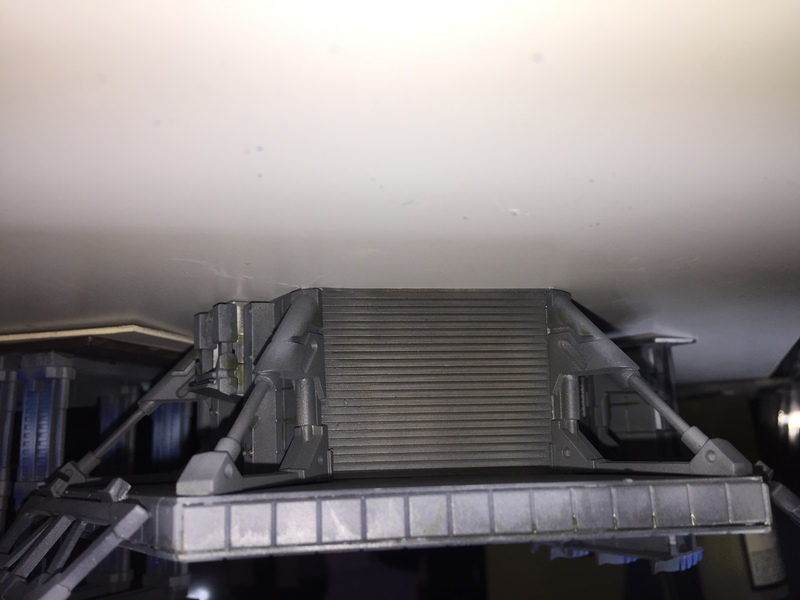 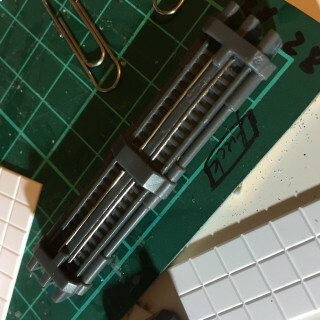 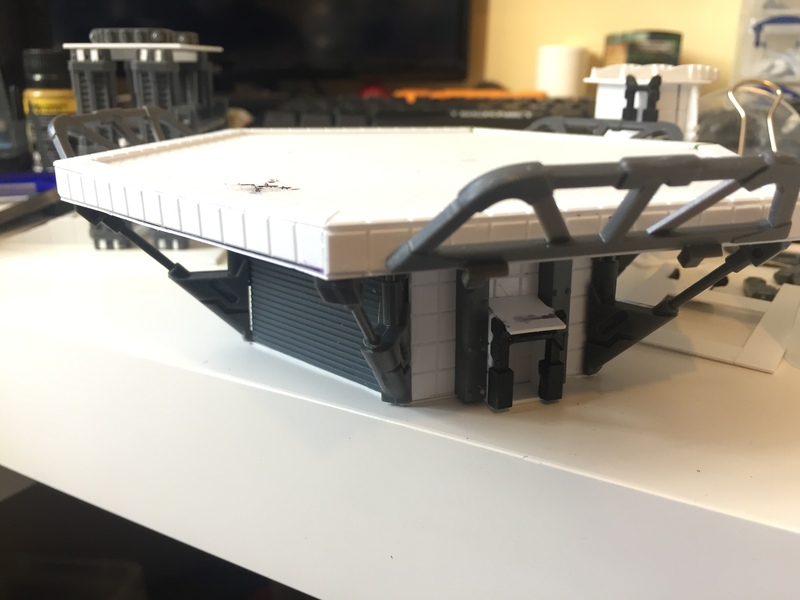 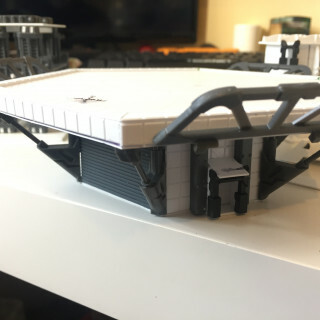 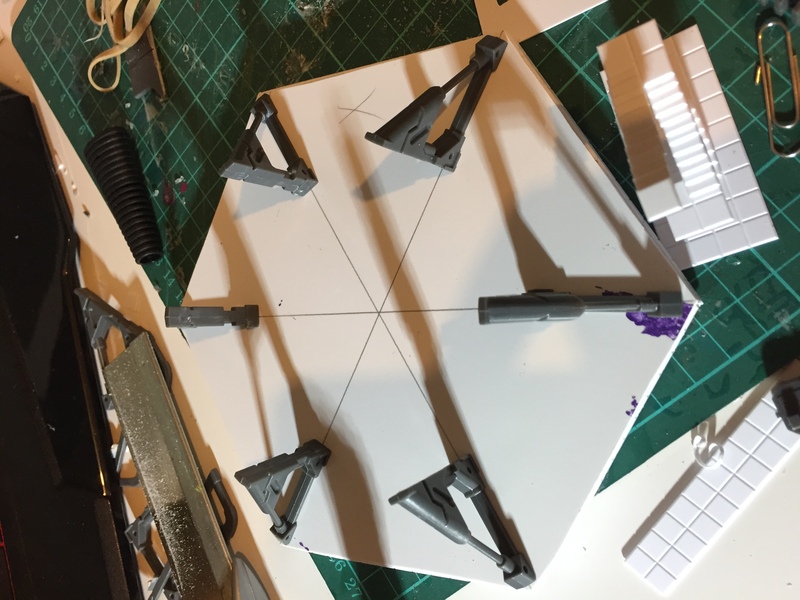 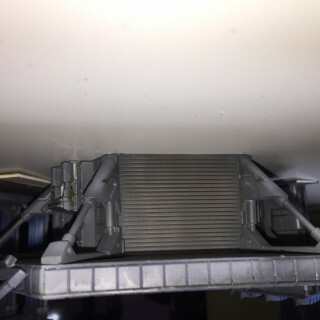 I wanted to add a lift to move between the platform and the ground level, so I raided the mantic bits I had and built the frame of a lift from 4 support pillars, with paper clips glued to the inner bar. 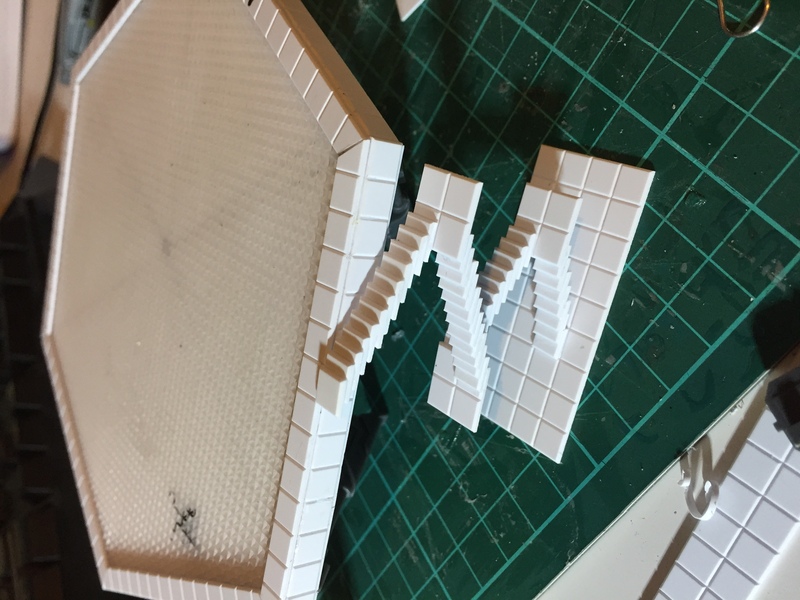 I then took a door and added magnets to the 4 corners using L bracket connectors. 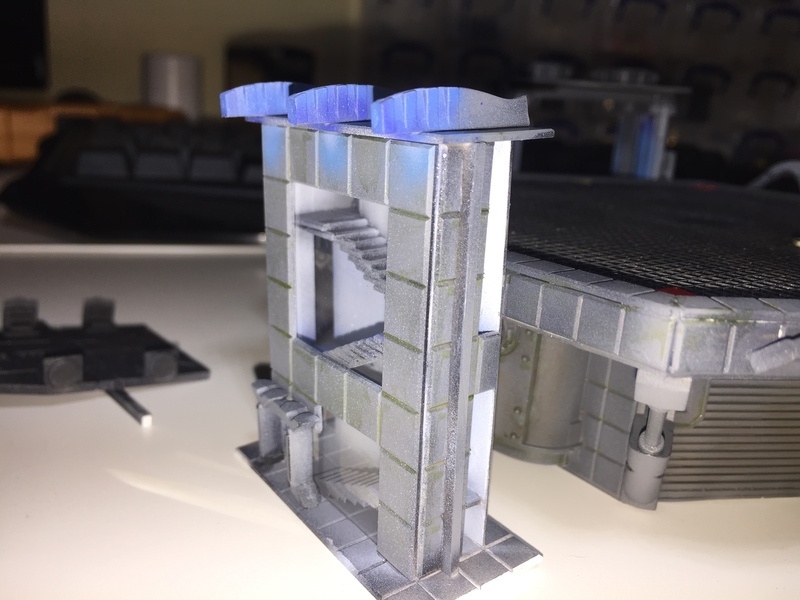 The last step was to build a stairwell… honestly I don’t know why but I really wanted to do this bit! 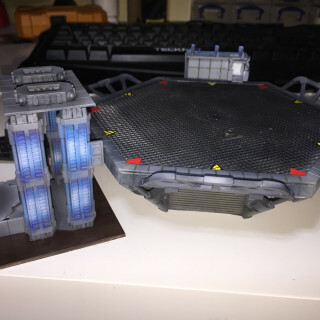 My goal is to build a collection of scenery to use with Dropzone Commander so that I can play a few games outside of the usual urban city setting. 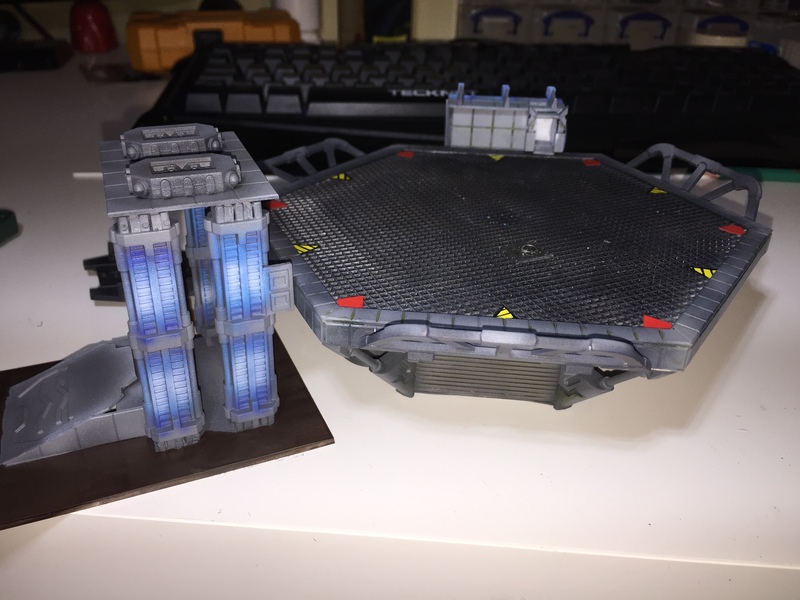 I love dropzone, but always playing in a city, even one made up entirely of 4Ground’s amazing terrain, can get a little dull. 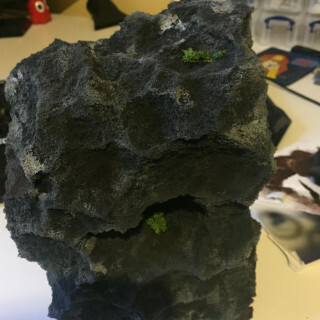 The idea I decided to try to tackle is to create an environment where the colonists of this particular world built into the mountains and rock faces of valleys. 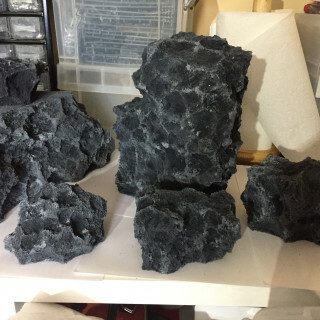 I plan to have buildings and walkways between some rock faces but mostly I want to create the look and feel that the structures have been dug into these mountains. 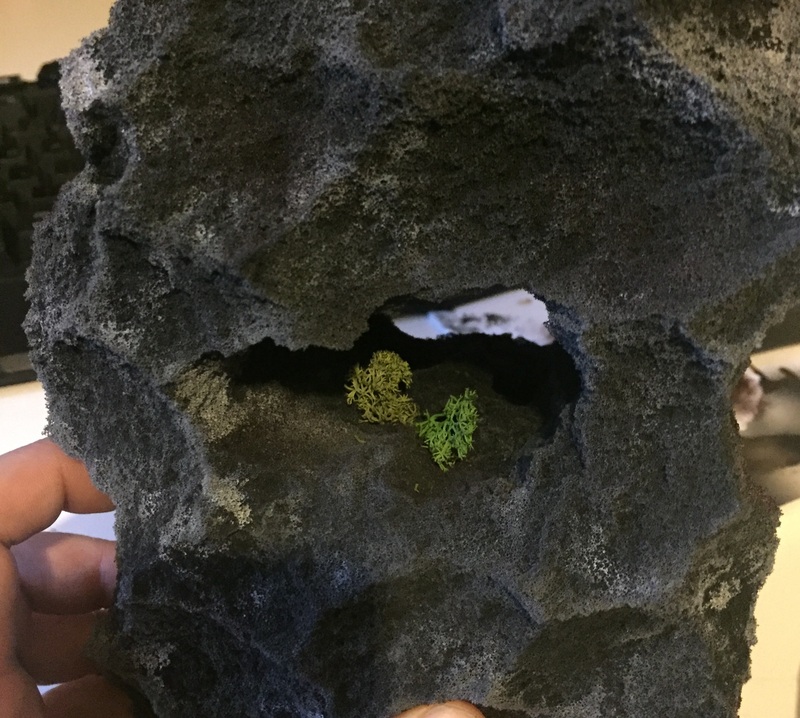 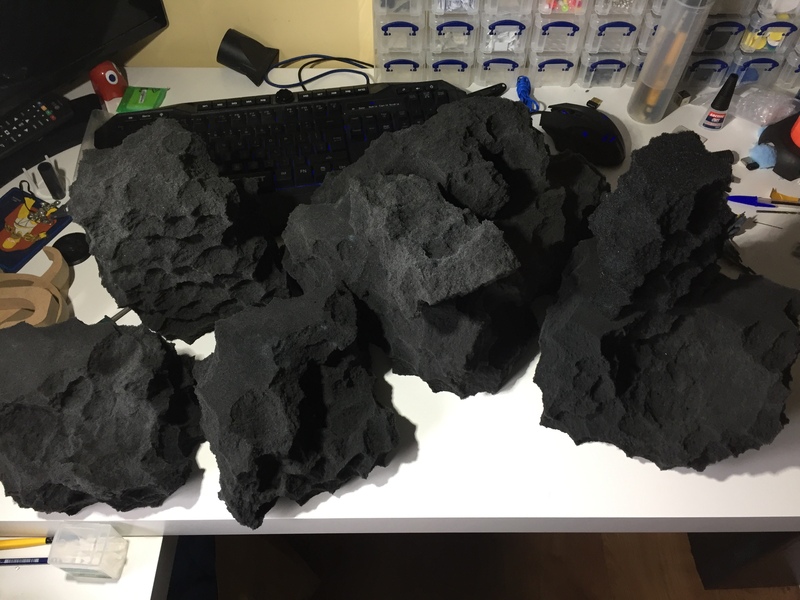 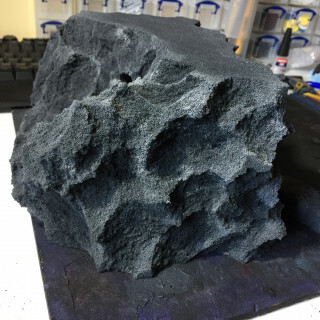 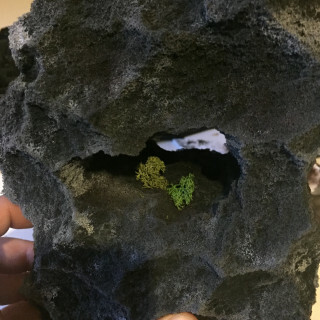 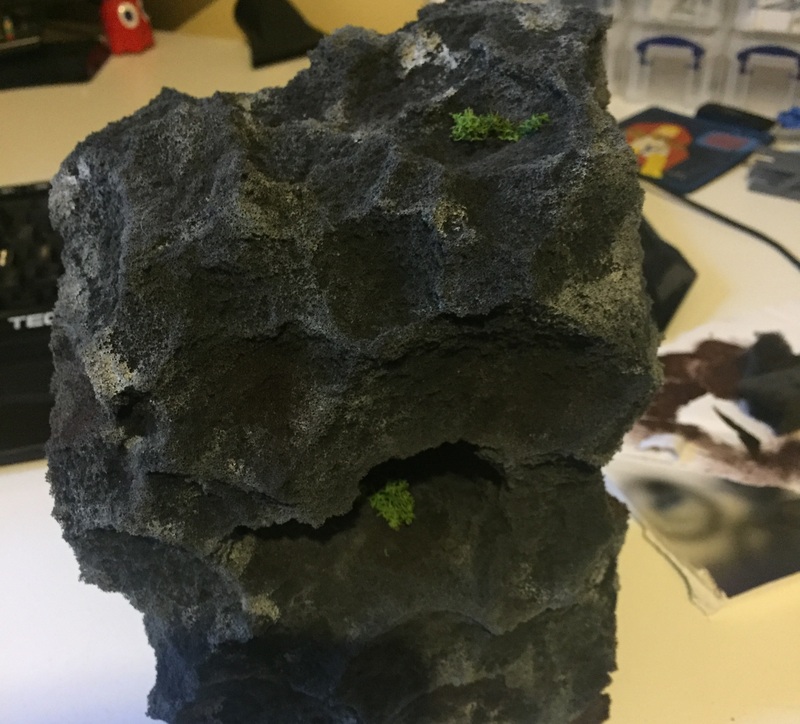 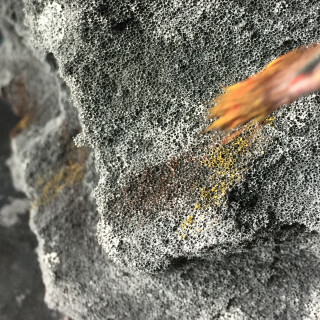 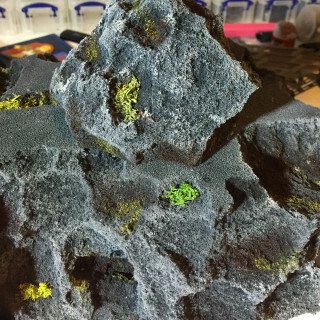 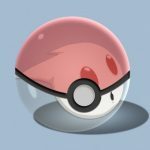 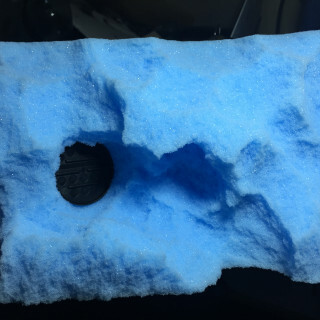 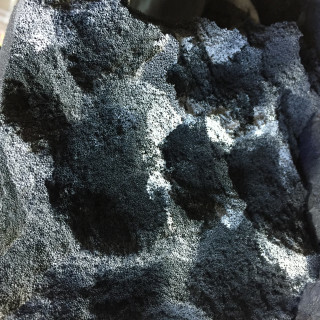 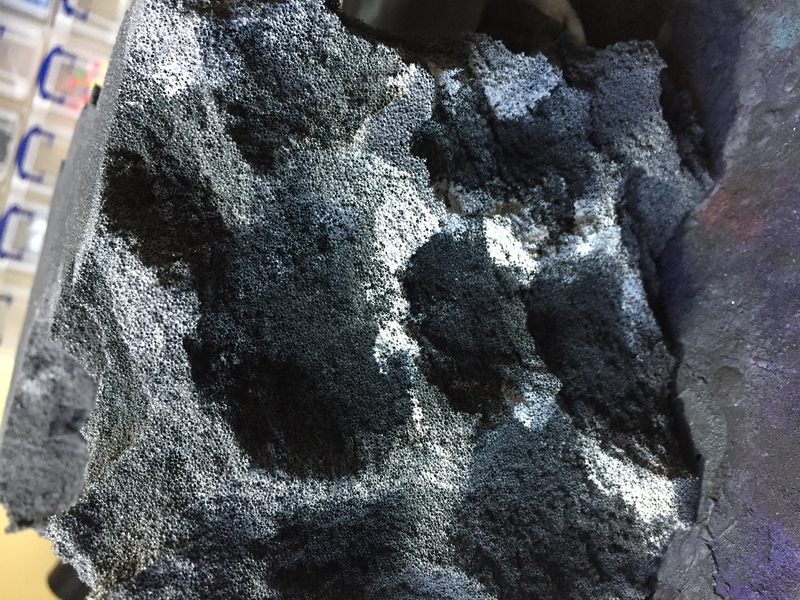 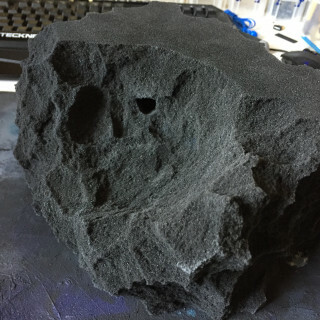 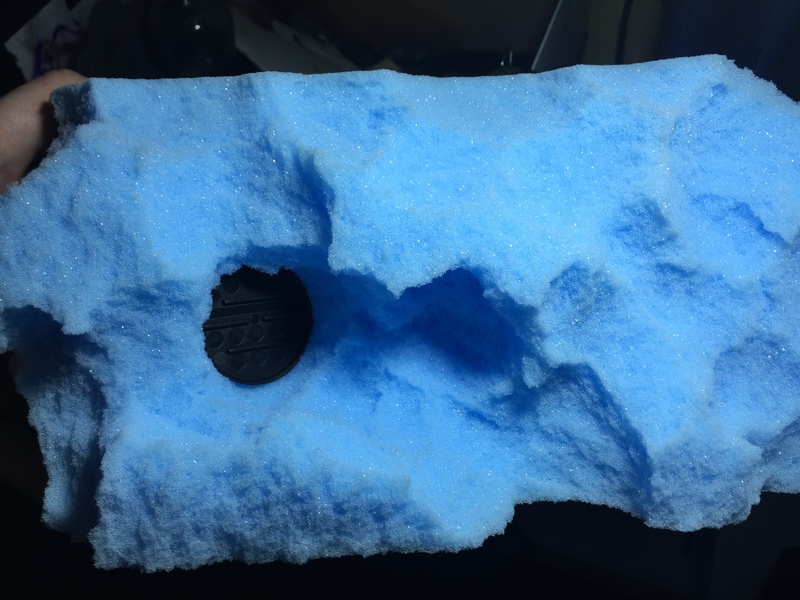 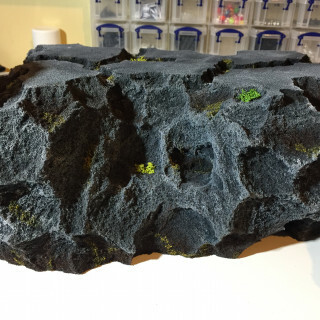 I’m going to be using the now infamous foam rock terrain technique. 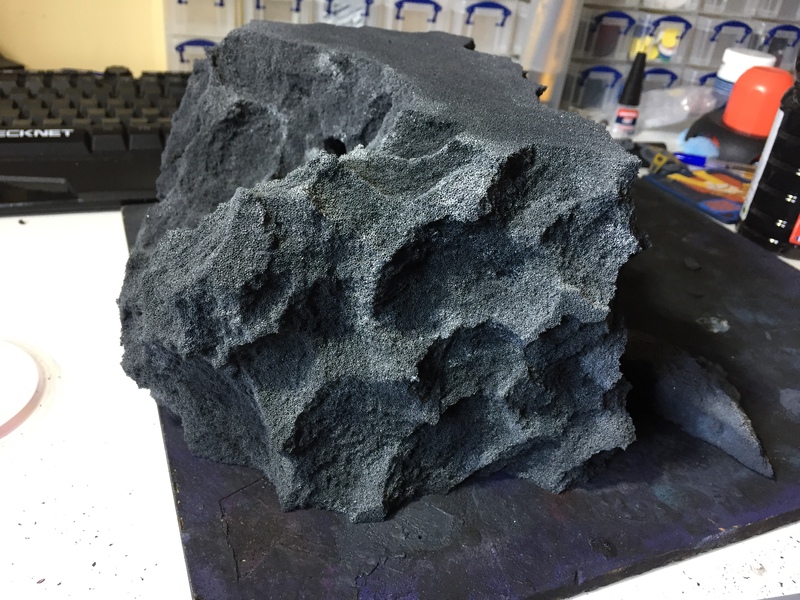 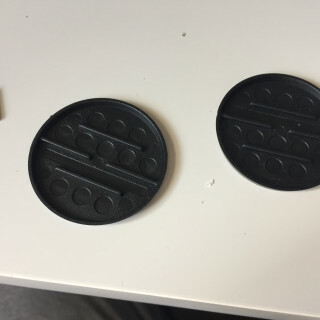 The second objective is to make the foam rocks relatively scale independent so they can also be used in 28mm games if so desired. 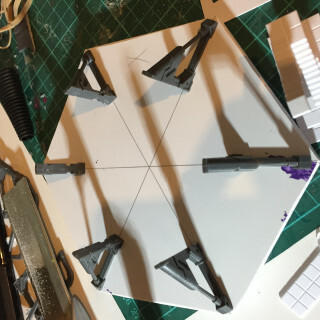 Those two objectives are pretty incompatible, so my plan (if it works out) will be to make it so that the various building elements are removable from most, if not all of the foam terrain. 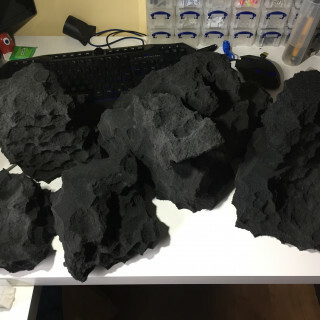 I raided my box of random crap which I have been hoarding for years and found many things which will be useful in making this project come to life. 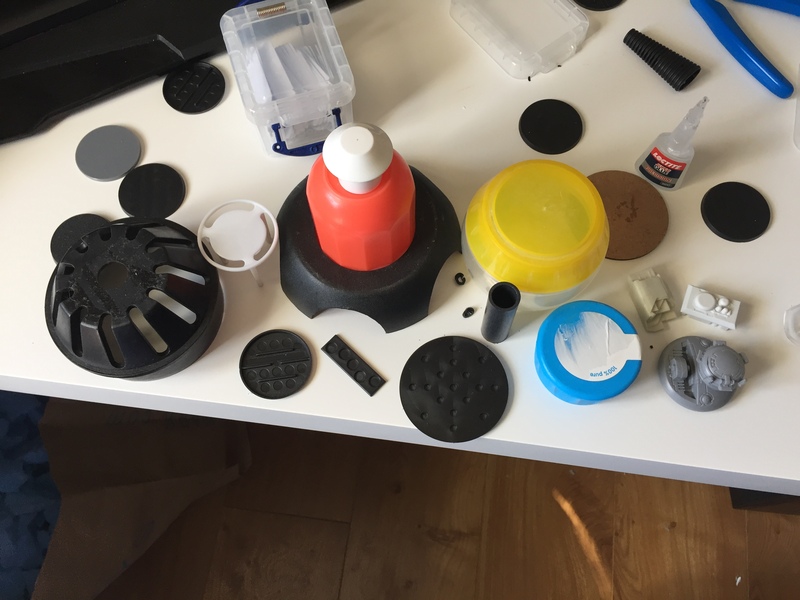 I also dipped into my bitzbox and pulled out a load of useful items which have been moved to a project box. 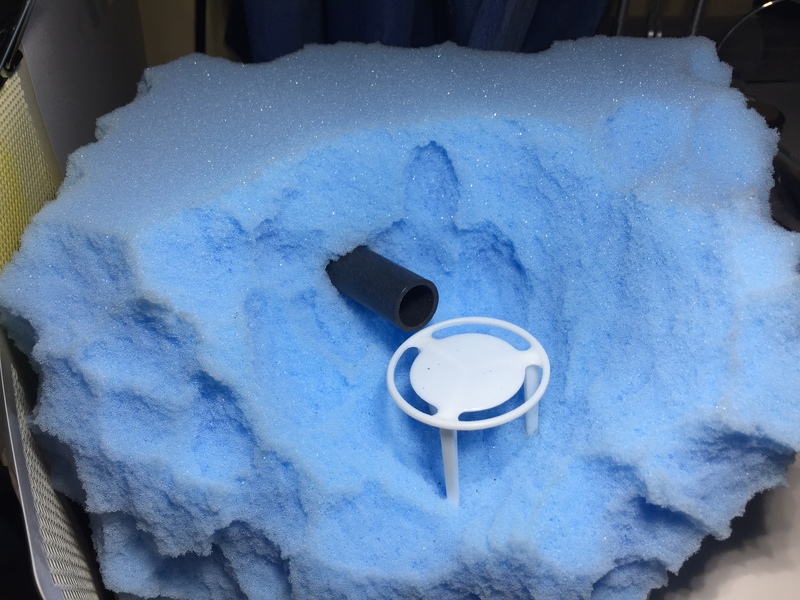 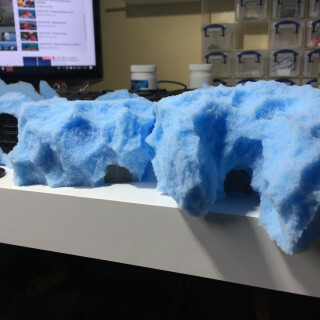 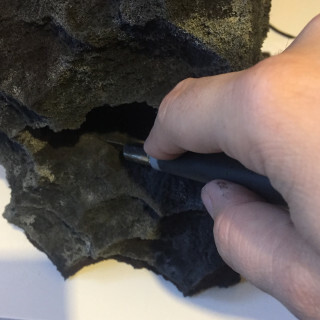 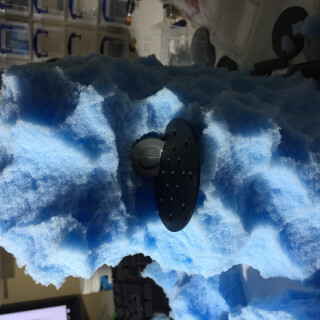 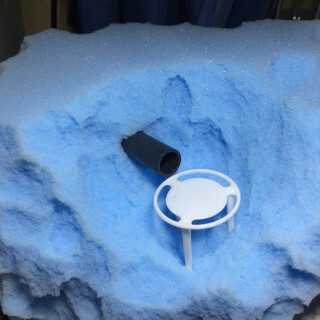 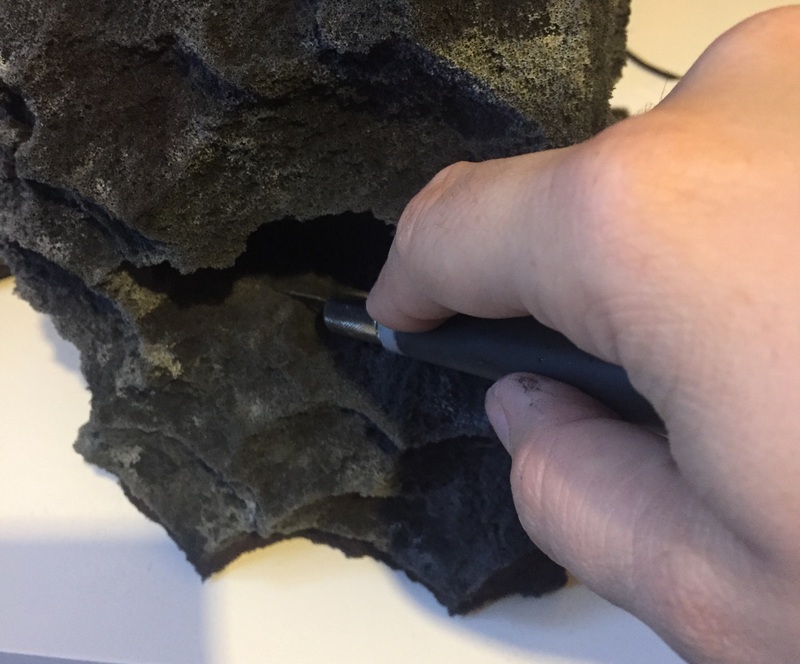 I have plucked the foam in such a way that there are several spots where pieces can be wedged into the crevices and other nooks and crannies so that the foam just holds the structures. 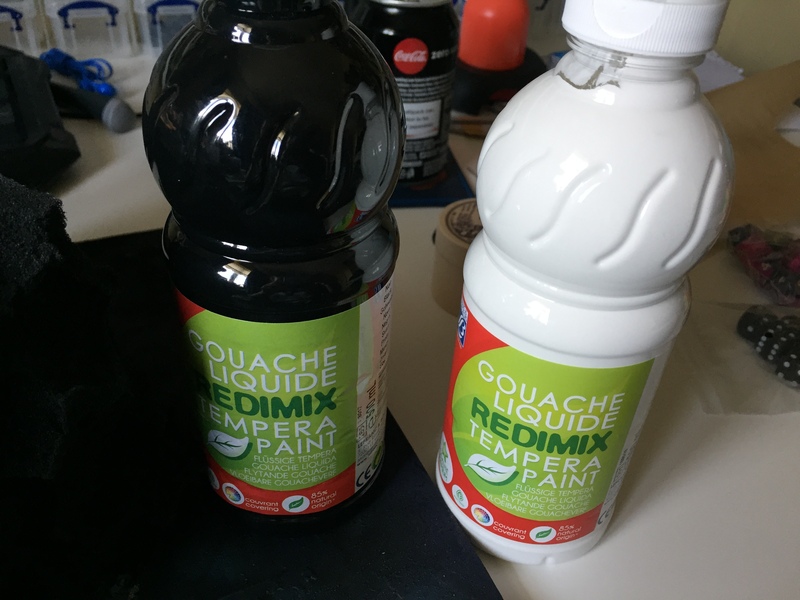 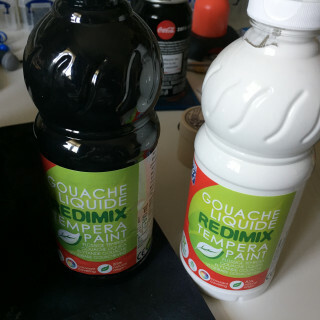 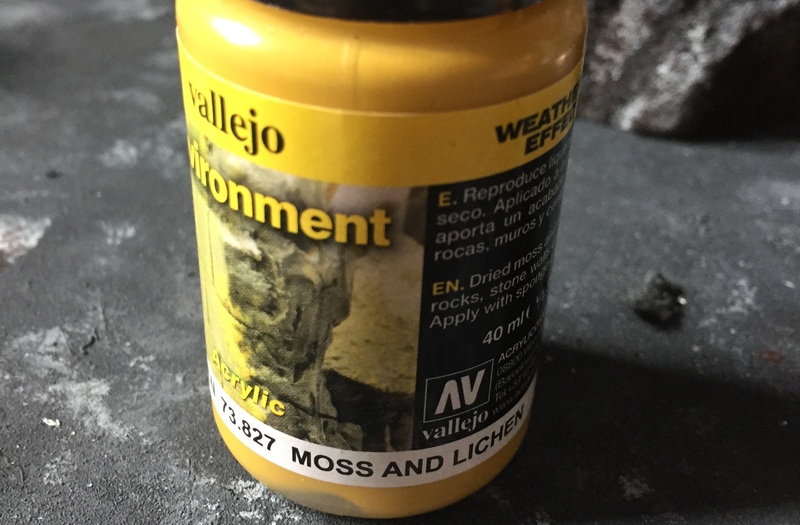 It’s flexible and durable enough that removing the pieces won’t damage the paint, which is great! 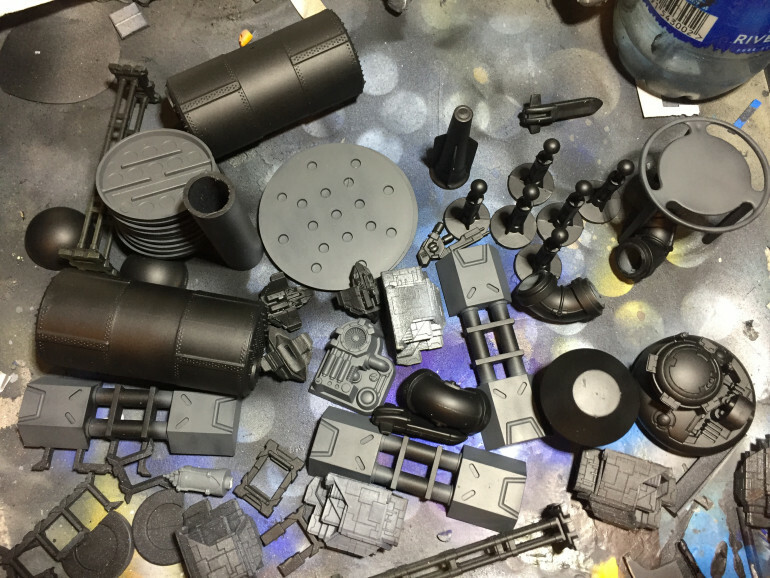 Heres a few unpainted pieces with the building elements. 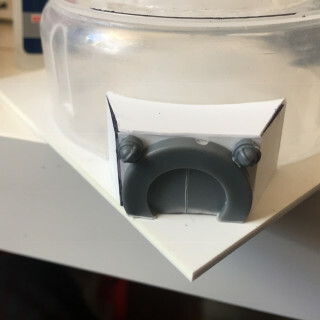 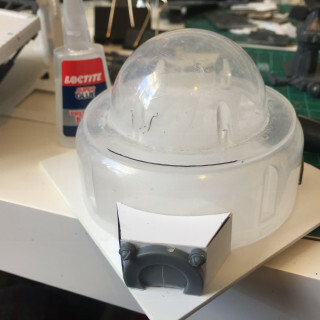 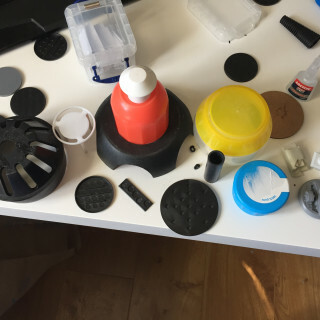 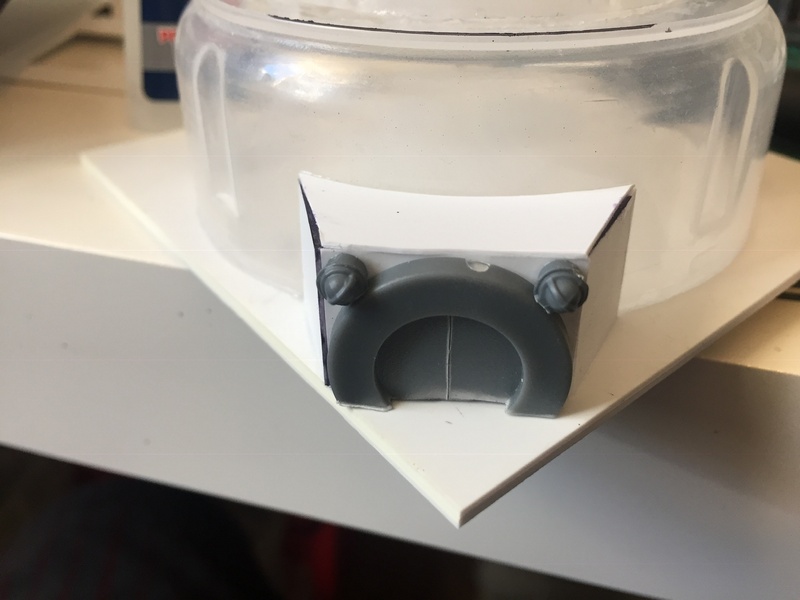 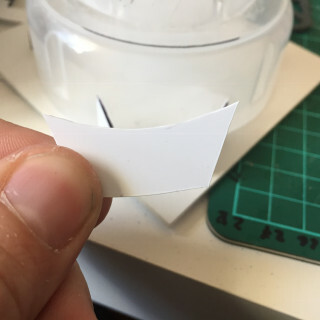 Some things I’m using are the underside of injection moulded miniature bases (specifically from Mantic) which have a series of circular shapes which at 10mm, are perfect for representing windows, once painted up properly. 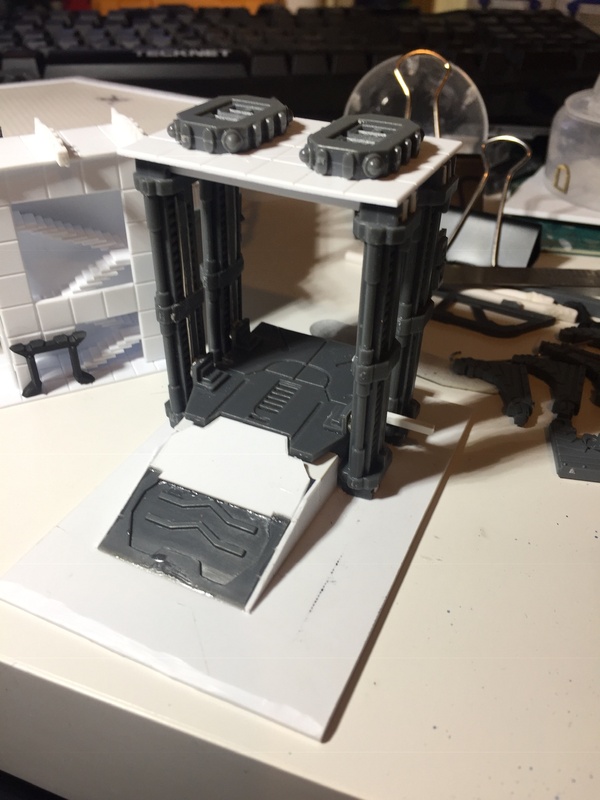 I’m also using a lot of Mantics Battlezone terrain pieces for support structures, conduites or walkways. 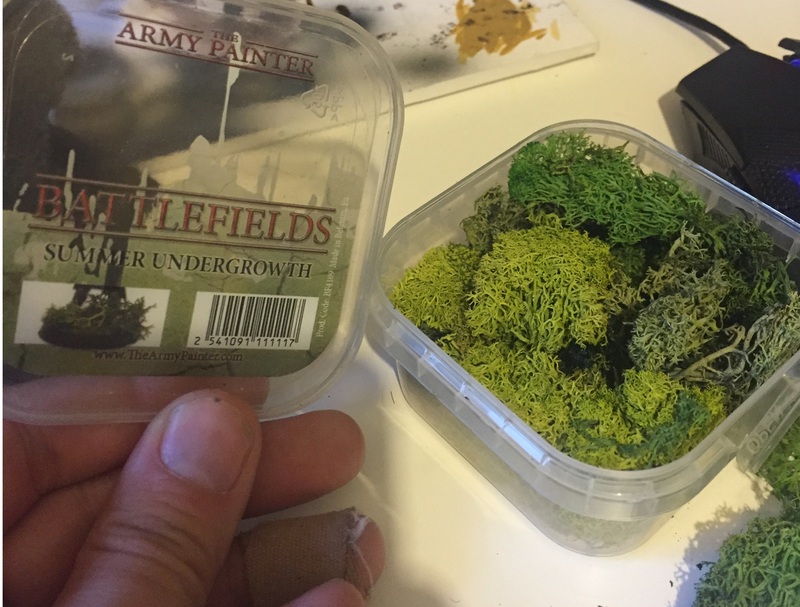 The painting process uses a lot of paint, so I opted to go with poster paints available from your local arts & crafts store or pound/euro/dollar store. 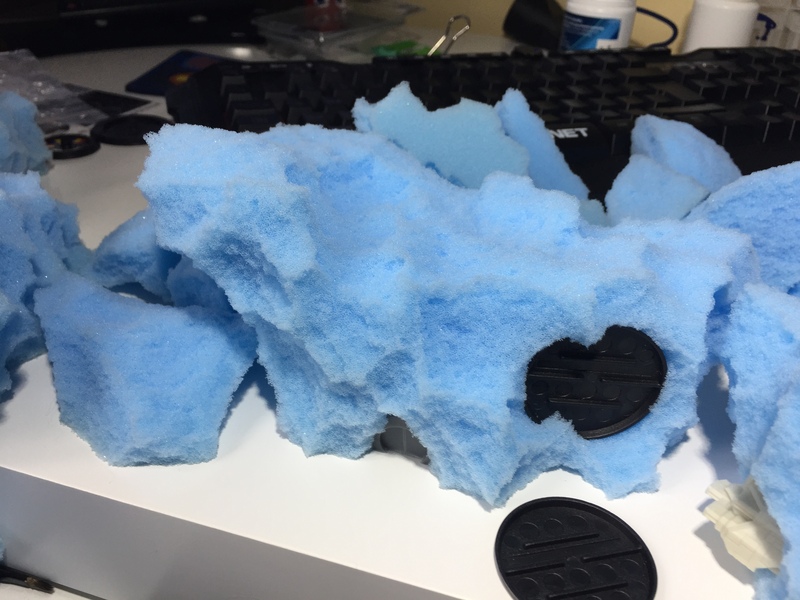 This stuff is watered down and the foam just soaks it up. 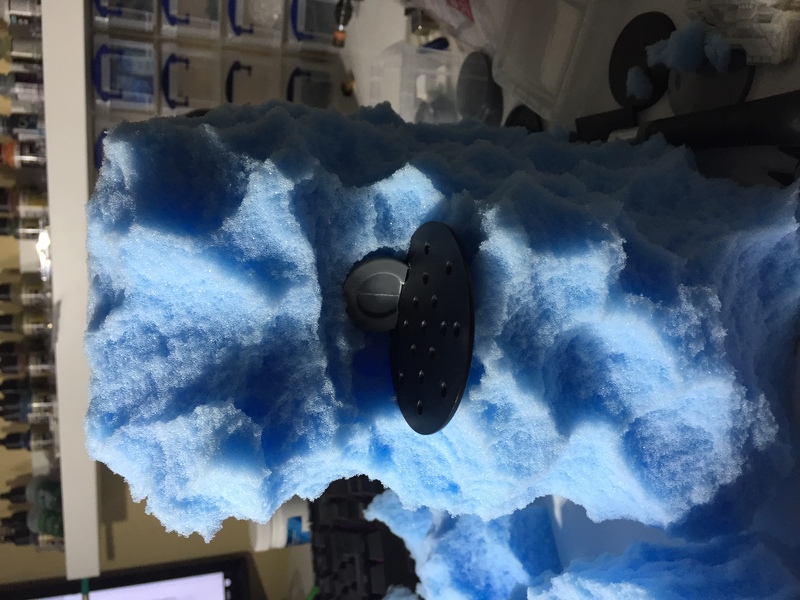 The drying time is horrendous (2 days for the bigger pieces), but the coverage is amazing, and goes right into the foam, so cutting away at it afterwards wont require a cover up. 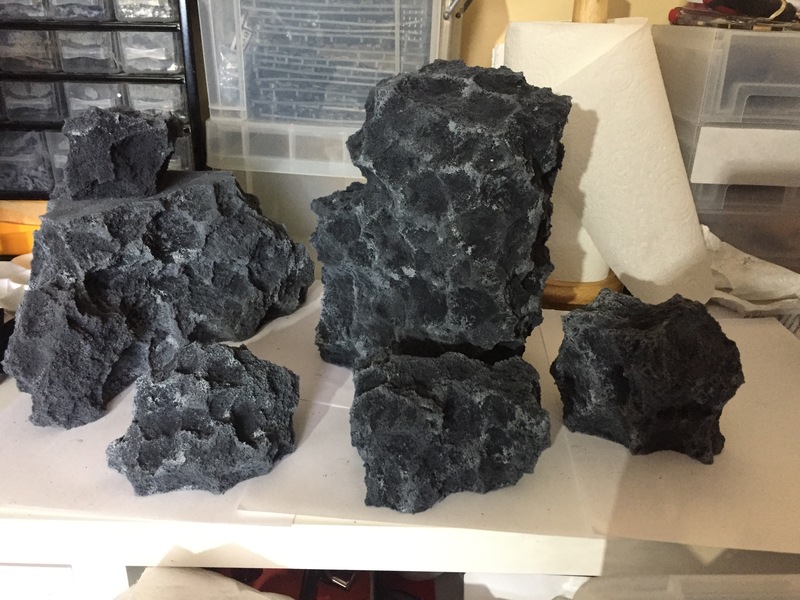 I am highlighting these by mixing progressively more white into the mix and using spare bits of foam as a makeshift drybrush. 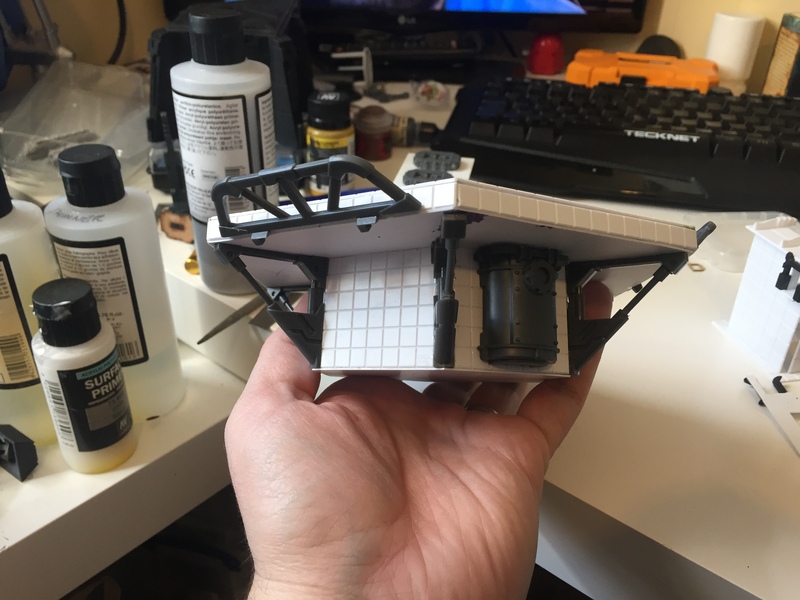 Next step is the super detailing. 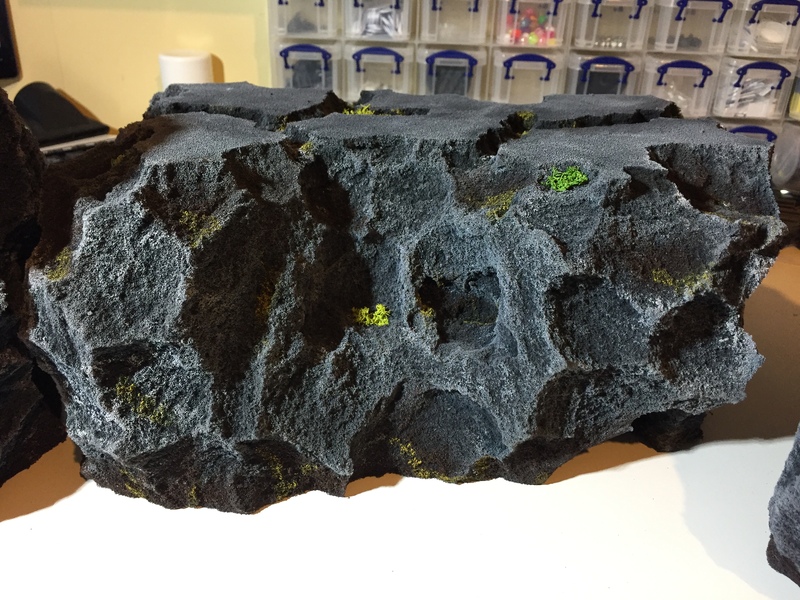 To make the mountains look a bit more lifelike, I grabbed some lichen and sliced some crevices into the foam and stuffed them in. 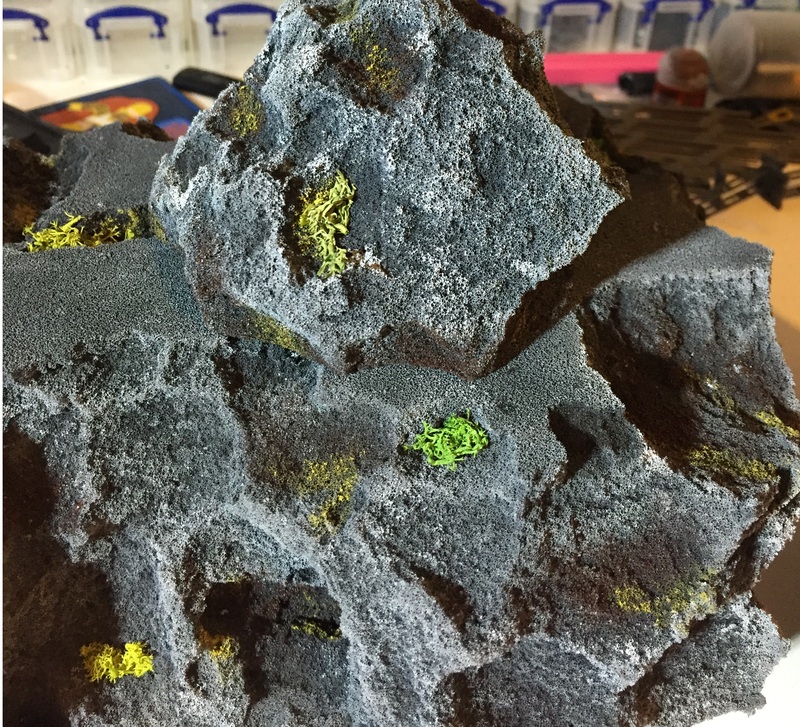 I also used the Vallejo Environmental Weather Effect paint Moss & Lichen to apply some yellow/green to the foam rocks wherever looked right. 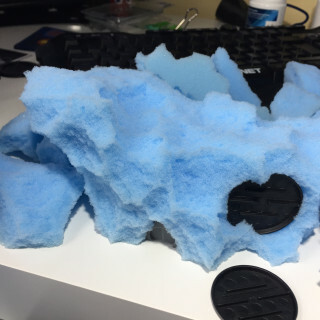 This really helps make the foam look more rocky. 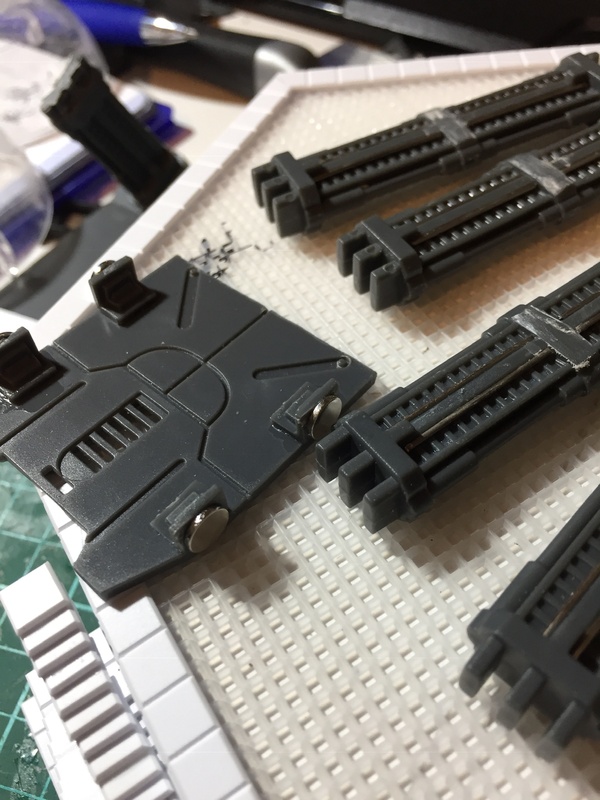 Before this step I really wasn’t too happy with the overall effect, and now I am very pleased with them.